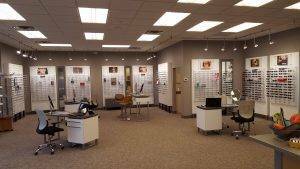 Each of our clinics has an extensive optical with an educated staff to guide you in eyewear selection. The frame selection is chosen carefully to offer unique styles not found elsewhere, including children’s frames and sunwear. Frames and fashion are constantly changing, so we update our inventory weekly. Our emphasis continues to be the highest quality frames and optical materials available. We guarantee qualitywork that you will be pleased with. Authorized distributors for Maui Jim Sunwear and Oakley Eyewear. Featuring great frame lines including Alain Mikli, FYSH/Kliik, ProDesign, Lafont, Tom Ford, Callaway, Nine West, Nike, Kate Spade, and Silhouette.